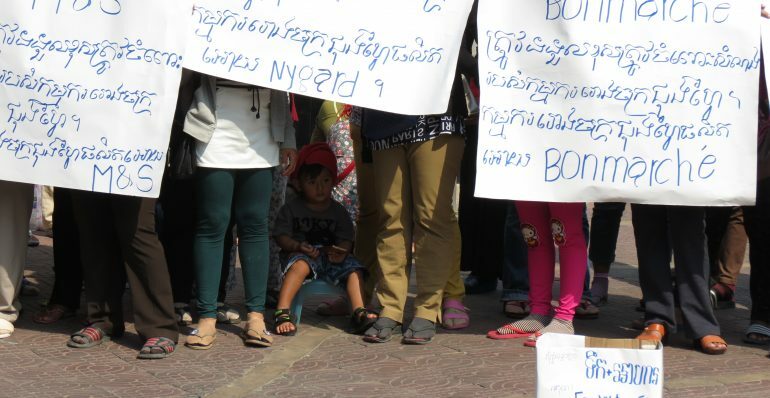 The sudden closure of a garment factory linked to UK and Canadian brands has left 208 workers in Cambodia without jobs, salaries or compensation. A year later these workers, largely women, are still fighting for justice and are in a desperate situation. As they stitched clothes for UK brands Marks and Spencer and Bonmarché, as well as Canadian brand Nygård, the workers are demanding that these companies take responsibility and give them the legally due payments that their supplier failed to provide. One year ago, on 1 July 2016, the 208 workers of the Chung Fai Knitwear Factory suddenly found themselves unemployed, without notice, without severance pay and without even receiving their final salaries for the previous month. Well over half of these workers, 126, had been employed at the factory for more than ten years. The workers claim an amount of USD $550,000 is needed to cover their final month’s salaries and lawful severance pay. After their sudden dismissal, the workers – the large majority of them women – were left to fend for themselves. And so they did. They stood up for their rights by preventing the owners from selling the remaining assets from the factory, through physical occupation of the factory as well as legal measures. On 26 July 2016, the local court issued an injunction order which temporarily froze the assets of Chung Fai. 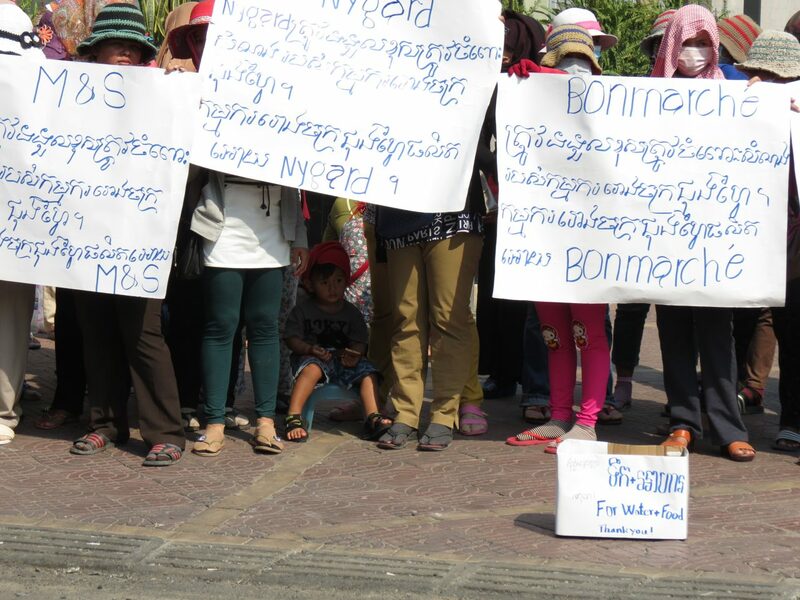 The workers continued their struggle with appeals to the brands sourcing from their factory, urging them to intervene and provide the justice that the Chung Fai owner was denying them. Labels carrying the names of British brands Marks and Spencer (M&S) and Bonmarché as well as the Canadian brand Nygård were collected by workers in the factory. All three brands initially denied contractual relationships with Chung Fai. M&S described the labels collected by the workers as ‘invalid’. There is a high prevalence of illegal subcontracting in Cambodia, but the lack of official ties does not mean that these brands had no orders at the factory. If the orders at the factory were the result of subcontracting, this does not absolve the brands of responsibility for workers in their supply chain. The United Nations Guiding Principles on Business and Human Rights (UNGP) clearly stipulates the responsibility of companies to ‘avoid causing or contributing to’ as well as ‘seek to prevent or mitigate adverse human rights impacts’ linked to their business relations. That covers all workers in their supply chain. Bonmarché later admitted that their clothing could have been made at the factory. Bonmarché communicated with their official supplier that no future orders would take place until the case was resolved. M&S and Nygård continue to deny any involvement. A year after the closure, a solution for the workers is desperately needed. Due to their sudden and unexpected joblessness and the absence of severance payments, the former Chung Fai workers have been left in economic hardship, often forced to take out loans to make ends meet. These women are often breadwinners, providing the family income for their children, parents and partners. Garment factories tend to hire young women, which means that many of the long-time workers at Chung Fai are struggling to find new employment and their debts are accumulating. The heart-breaking stories following the closure of the factory include workers suffering from ill health due to their long hard work in a badly ventilated environment, now left without enough money for medical treatment.